MindJet is releasing an upgrade to MindManager, its signature mind-mapping program for the Mac. More importantly, the company is also readying the first iOS versions of the app. 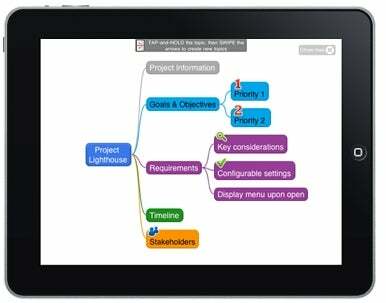 MindManager’s purpose is to organize ideas visually in expandable “mind maps.” One typical mind-mapping scenario: You’re in a brainstorming meeting, people are shouting out ideas, and you need a way to capture and organize them quickly. The new version, MindManager 9, has a few new tools to make that process easier. While MindManager has been around for a while on the Mac, the new iPhone and iPad versions of the program are brand new. MindJet has tweaked the interface specifically for iOS devices. To create a new topic, you swipe on the screen; depending on the direction you drag your finger, that topic will be the parent or child of another. You can add Web links, icons, and images in a map, and change the color or shape of topics. Instead of the standard single-tap for summoning cut, copy, and paste, the mobile app uses a wheel of icons; you cycle through the options by circling your finger. Mind maps you make on the Mac can be sent to the iPad or iPhone via Dropbox or e-mail, and vice versa, with little loss. (If your map includes to-do items, some task details—such as progress and resources—won’t be editable on the iPad or iPhone.) Maps are also compatible with the Windows version of the program, if you’re in a cross-platform office. MindJet is accepting pre-orders for the Mac version starting Wednesday; it expects to start shipping by the end of June. It will cost $129 if you’re upgrading from versions 7 or 8 of the program, $250 otherwise. The company is waiting for Apple to approve the iOS apps; it currently expects them to be available by June 15. The iPad version will sell for $9, the iPhone version for $7.